Stockfish, the open source chess engine by Tord Romstad, Marco Costalba, Joona Kiiski, and Gary Linscott, is the winner of the 2016 edition of the Top Chess Engine Championship. Stockfish 8 won the 100 games Superfinal match against Houdini 5 with a total score of 54,5 – 45,5. This is the second TCEC gold medal for Stockfish and it comes after the title in Season 6 and two runner up positions in Seasons 7 and 8. The third position in 2016 is for the ex-champion Komodo. Stockfish dominated all the season by winning Stages 1 and 3, finishing shared first in Stage 2 and storming through the Superfinal. 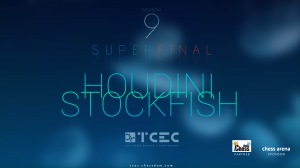 Houdini upgraded its version to Houdini 5 dev to take the rapid section of the event, but even the upgrade to the official Houdini 5 did not help in the Superfinal against the new Stockfish engine. The Superfinal match was the strongest chess encounter in history. Both engines played at about 3300+ ELO, thanks to the solid 44 cores server provided by the massive support of the community and a final push form the organizers of the event. Congratulations to the winner Stockfish, the runner-up Houdini, and the bronze medalist Komodo! Certainly more amazing chess is coming from them in the next Season 10 of the Top Chess Engine Championship in the first months of 2017.